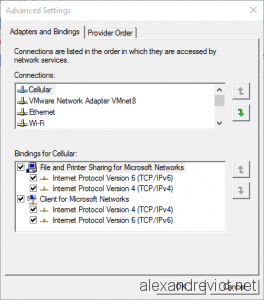 With Windows 8.1 and previous operating systems when you want to change the priority of a network card, you could change the Network Bindings using Advanced Settings in Network center. This interface always exists in Windows 10 but this function was deprecated. Changes in “Connections” are no more applied. You can tell me that on a workstation, we don’t use this feature, and it is true. 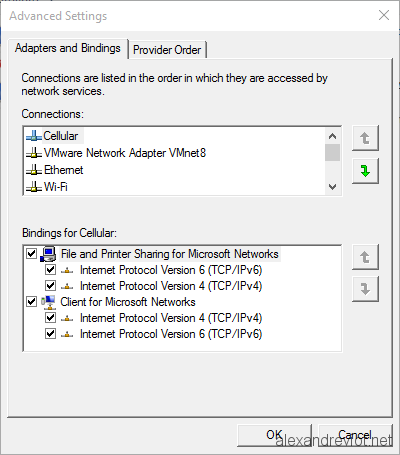 But I faced an issue with Windows 10, VMware Workstation and OpenVPN client. When my LAB is up and running (Host-Only network), host connected to internet using OpenVPN Client, sometime the host loses access to internet. After troubleshooting, my host queries the DNS in my LAB and not the DNS of OpenVPN interface, and so the query failed because the DNS server does not have access to internet. Let’s see how to solve this minor issue.